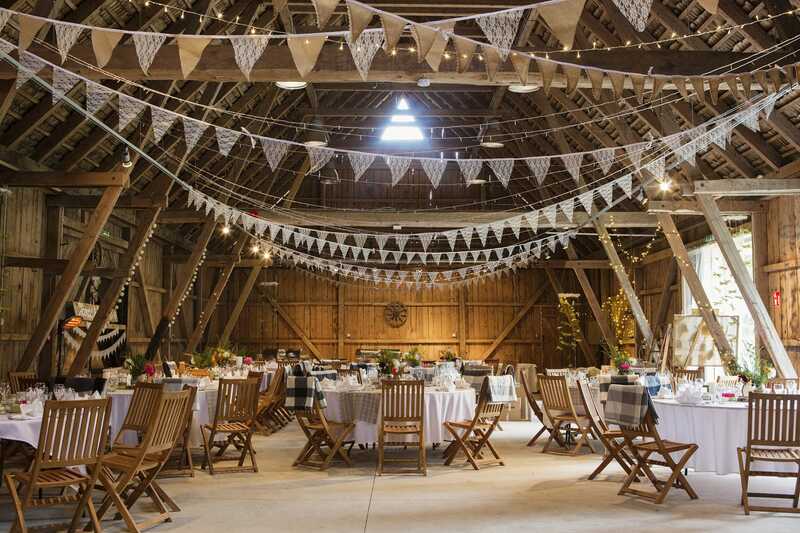 Hosting your wedding in a barn is a popular idea for those who prefer a more rustic style. It’s easy to see why many prefer it this way as couples can feel a better connection to nature and there’s a certain sentimentality associated with rustic barns. 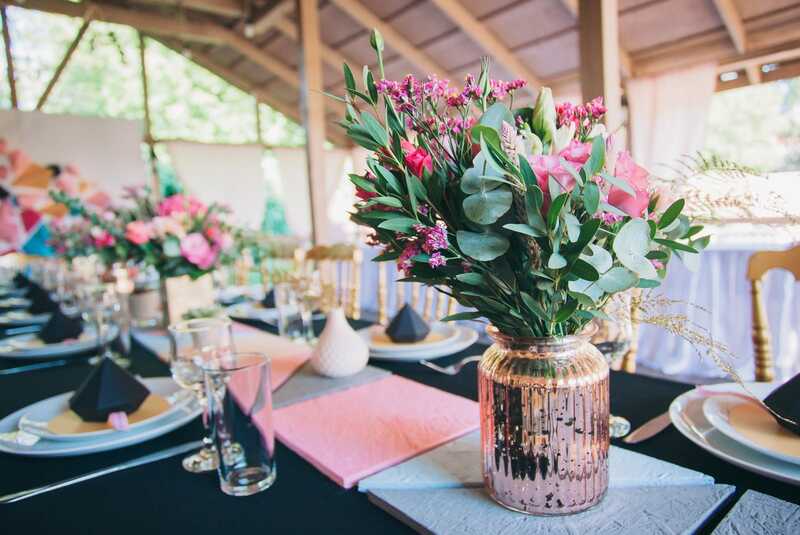 Even if this venue location might seem less sophisticated compared to other choices, it doesn’t mean that you can’t add some glamorous elements to balance things out. There’s a kind of art when it comes to getting the right mix of casualness and sophistication for barn weddings. We’ll explore some inspiring ideas to help you achieve the rustic wedding of your dreams. The main reason why couples go for this type of rustic celebration is due to their desire to embrace and feel closer to nature. 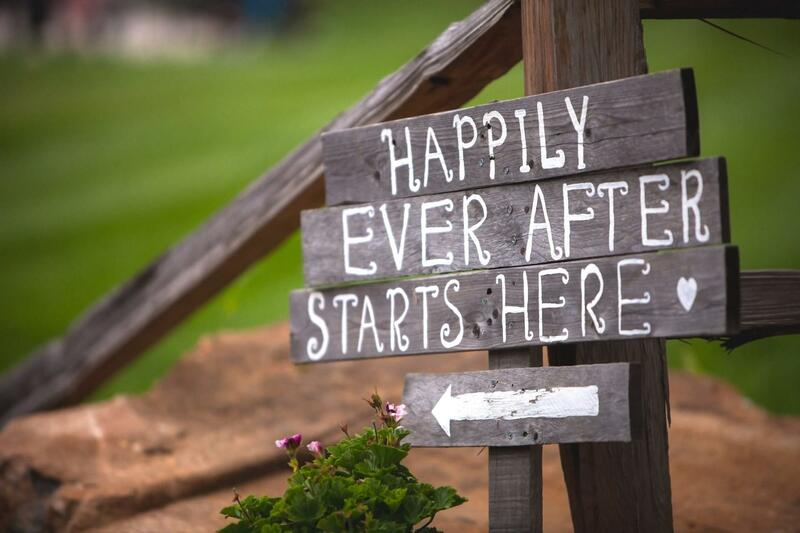 If you’ve taken care of the logistics and there’s only the decorations part left out, you’ll be glad to try out some of the following barn wedding ideas. Barn weddings can have distinctive concepts. Regardless of how you envision your dream celebration, it’s important to set the scene correctly. Consider bringing outdoor elements in for a more casual and relaxed atmosphere. 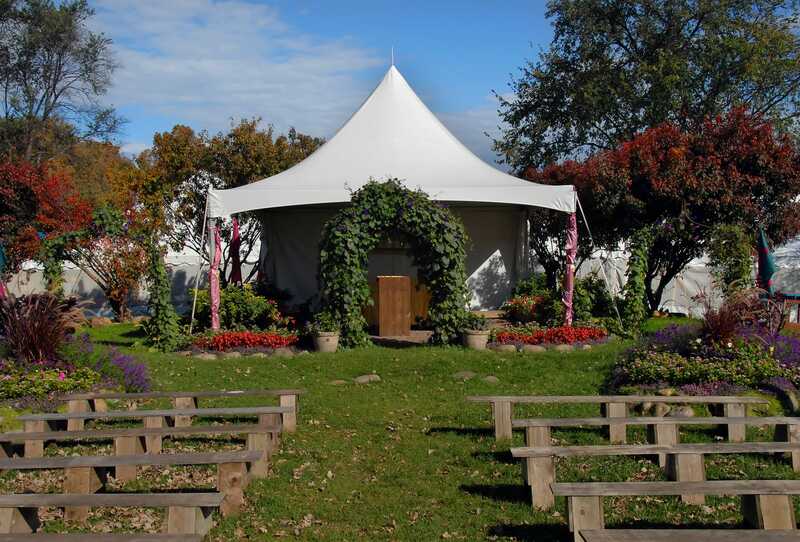 Ideally, the venue should allow for cozy places to mingle outside. You can always add a touch of the natural world inside as you can place some greenery and fresh flowers to improve the look of the overall wedding. Soaring ceilings are classic architectural elements of barns. You can use them for your benefit as you can hang various items such as lanterns. Try to mix the grand ceiling with low seating for a casual and intimate atmosphere. If the barn feels too cavernous, consider hanging some fabric to create the illusion of softer edges. This can boost intimacy even further and can also improve the acoustics of the space. If you wish to find a way to showcase some great decorations, a great suggestion is to use a ladder – the older the piece, the better. Making a ladder display can have a superb rustic effect particularly when you match the decorations with the same aesthetic. 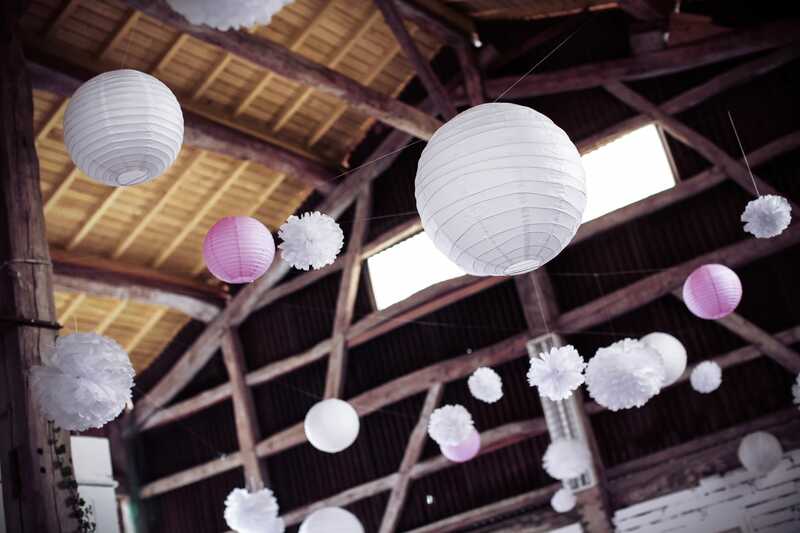 There are many methods for making your barn wedding more festive. A favorite of ours is simple bunting. There’s no need to go all the way with complex designs as just a bit of garland can add a delicate feeling that’s sure to keep the mood of everyone in high spirits. 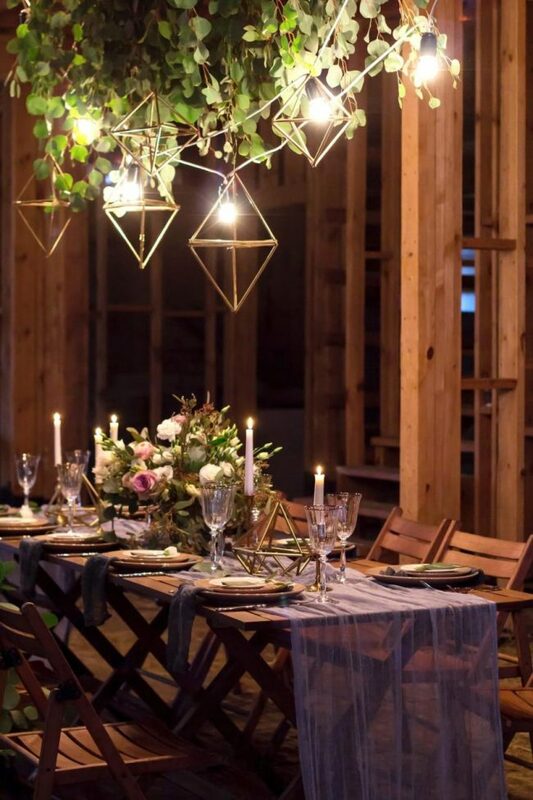 Using lanterns as centerpieces can add a unique rustic flavor for your celebration. 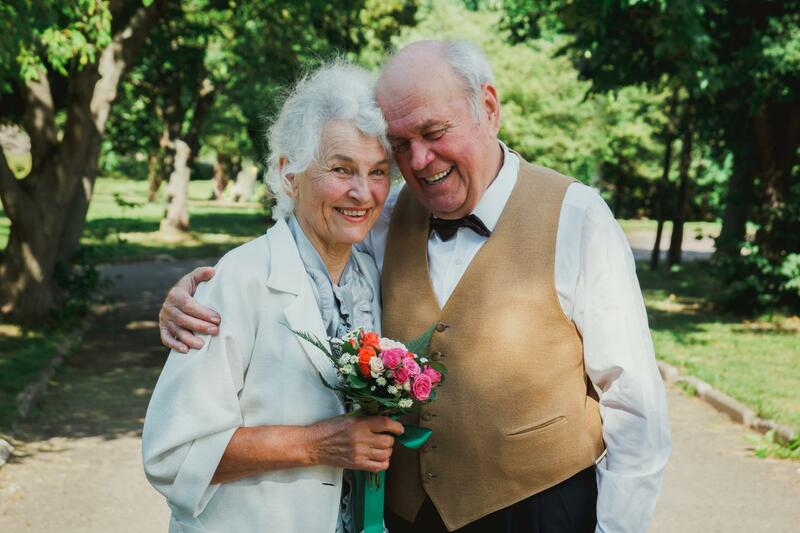 You can use them to light the aisle, but placing them as focal points of interest works quite nicely as well. This is a fun addition which allows you to expand with extra decorations to show off your styling creativity. We recommend getting a white bundle of lanterns such as this one found on Amazon. If you combine them with some scented plants you can boost the atmospheric effect. 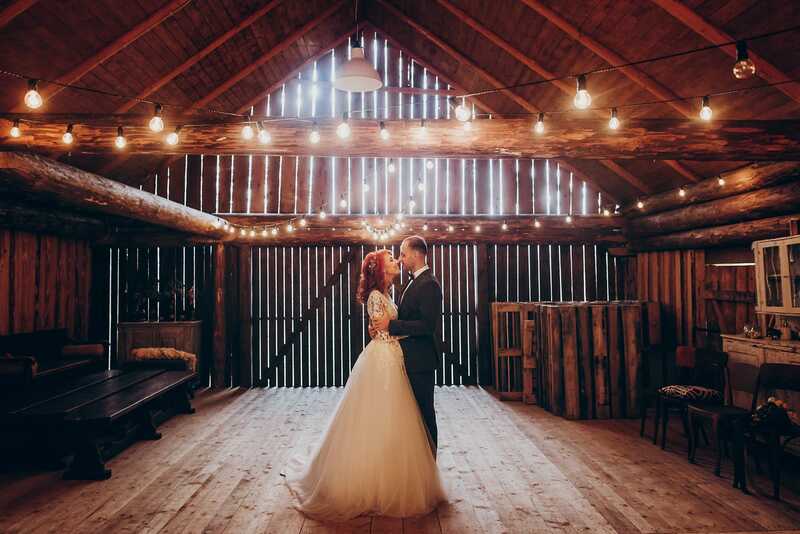 Using a beautiful barn as a backdrop for the vows ceremony is a must when it comes to having this kind of wedding. If things feel too rustic, there’s also the option to add a modern touch using some greenery in doorways. 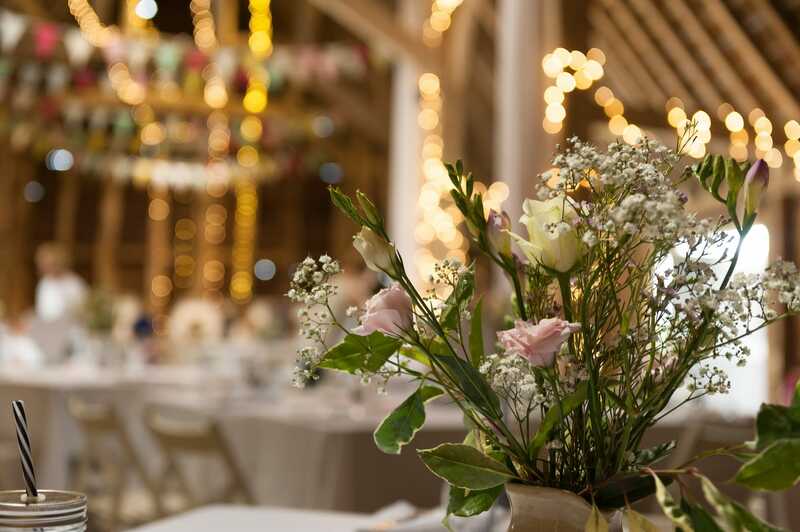 Classic white barns are especially great for rustic celebrations as they provide a very romantic setting. To make things look more festive, you could add some twinkle lights and candles. It’s also recommended to build a soft structure that can work as the main point of interest. The wood of the barn offers decent neutrality color-wise which means you can get creative with some bolder shades. The backdrop can be embellished with various colorful elements. 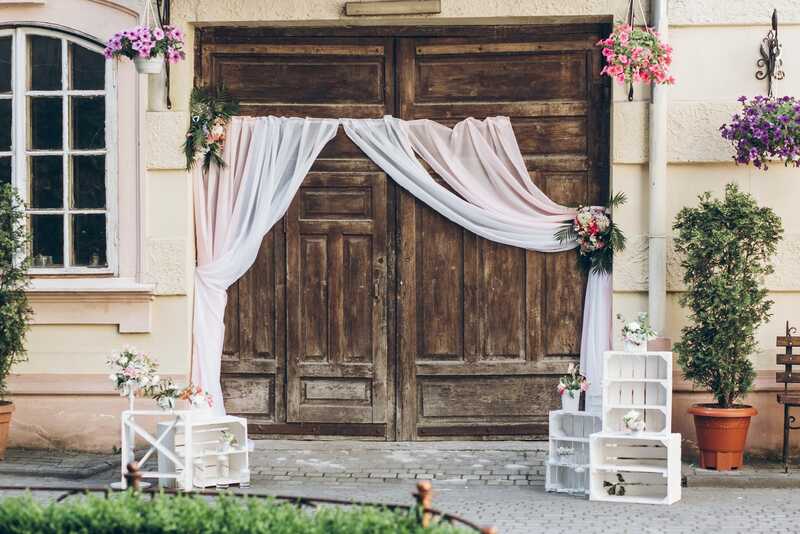 We recommend some soft pink fabrics, although some greens can also work well with the rustic theme. It’s all about finding the best shades to elevate the otherwise neutral-looking environment. Having fresh flowers everywhere isn’t just very expensive, but can also make things look way too cluttered. If you’re not a fan of that look, you can maintain a more minimalistic décor scheme. 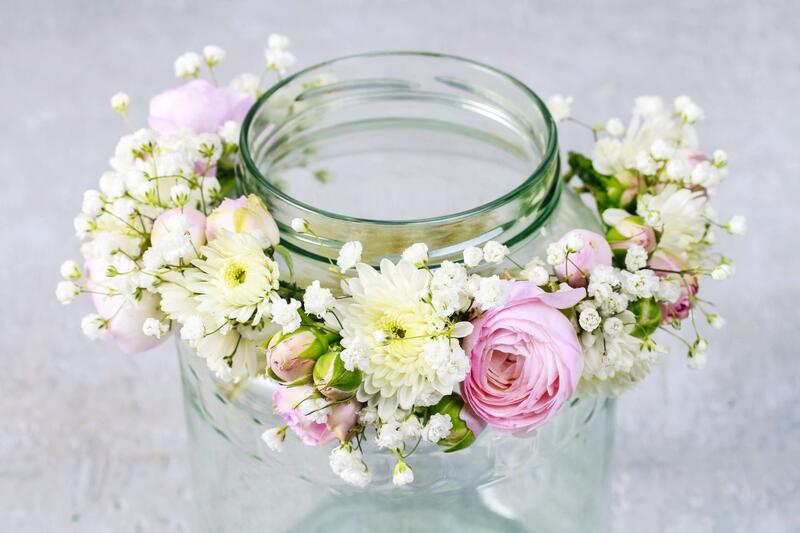 A simple floral arrangement in a Mason jar could be more than enough to fit in any barn wedding. Save on expenses while keeping the look fresh. 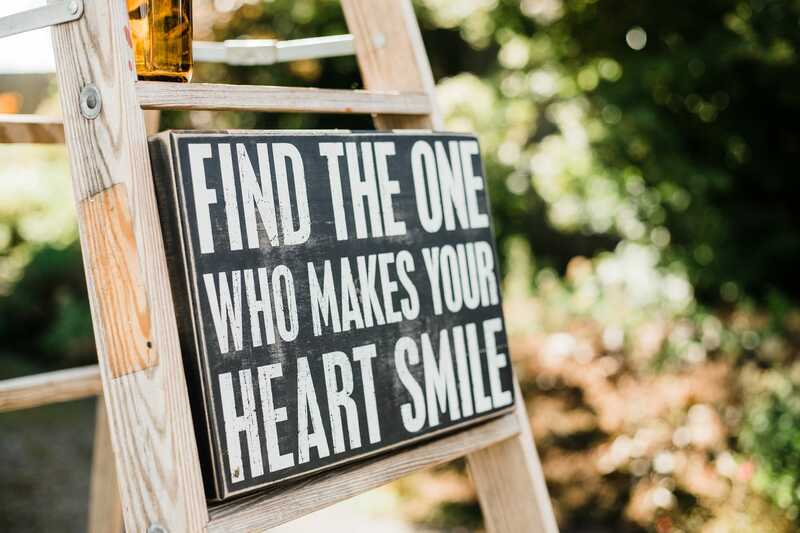 This idea requires a bit of DIY work, but if you can pull it off, it will work perfectly with any type of barn wedding. 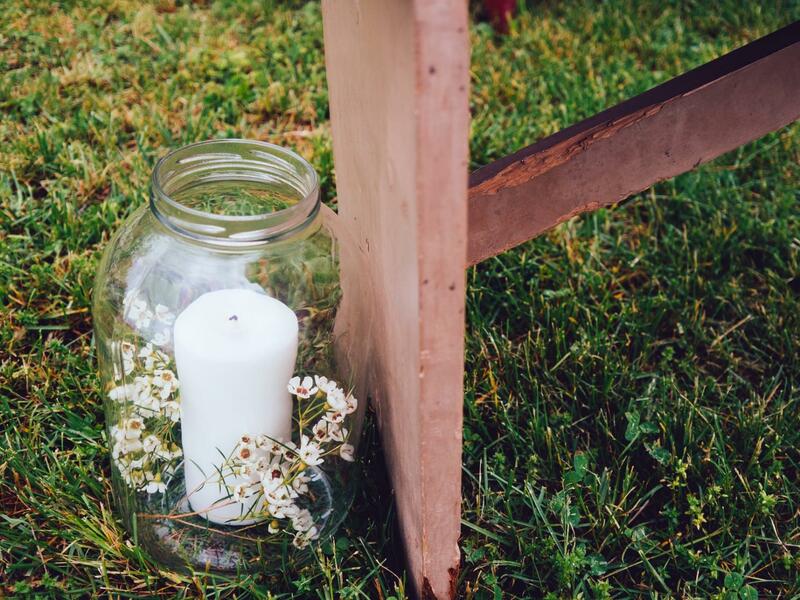 Floating candle votives provide a gentle light for enhancing the atmosphere of the ceremony making it more romantic and personal with minimal effort. This suggestion works great for various country-flavored weddings, and that includes barn celebrations. 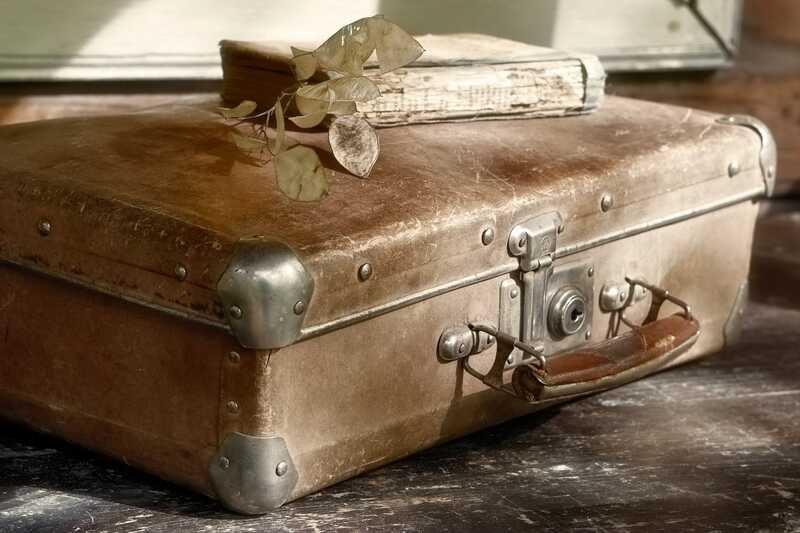 Having some antique suitcases decorated with congratulatory cards is definitely a unique idea that you could try to make your wedding more memorable for your guests. To maximize the rustic aesthetic of your barn wedding, it’s recommended to add burlap bows for the chairs or the tabletops. With a bit of work and some burlap scraps, you can put this classic barn fabric to great use for your celebration. 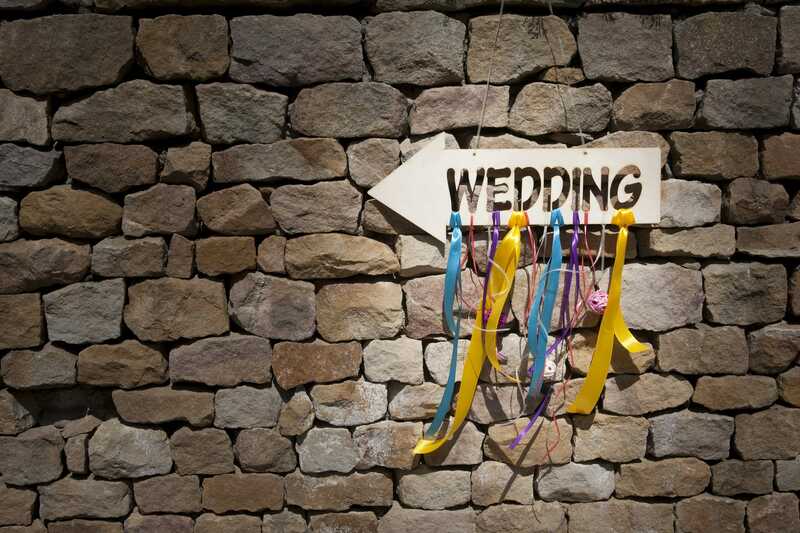 As country venues can be confusing with all their twists and turns, it’s a good idea to install a sign to help your guests find their way around. This presents a good opportunity for adding a rustic touch. Use a wooden sign with paint to craft something truly gorgeous. You can also make only a decorative sign with a personalized message for welcoming your guests. String lights offer a quick and easy solution for making the ambiance more exciting and romantic. This idea works best for an outdoor reception area, but it can create a pleasant mood for the indoors as well. An even more beautiful effect can be achieved by adding Edison light bulbs. Check out these string lights from Amazon that are specifically designed for larger events. 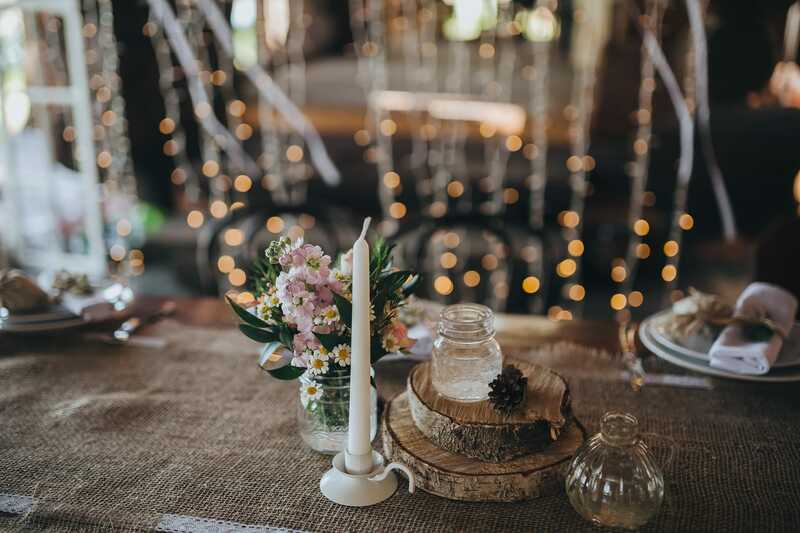 If you’re searching for an inspiring idea to decorate the tables at a barn wedding, why not choose something more unexpected to make a bolder statement? Glitter bottles offer a nice contrast with the rustic theme that you’d usually expect from a country-flavored event. Adding too much glam can have the opposite effect though. This is why just accenting with glitter bottles delivers enough of a glamorous vibe to suit the other rustic decorations. 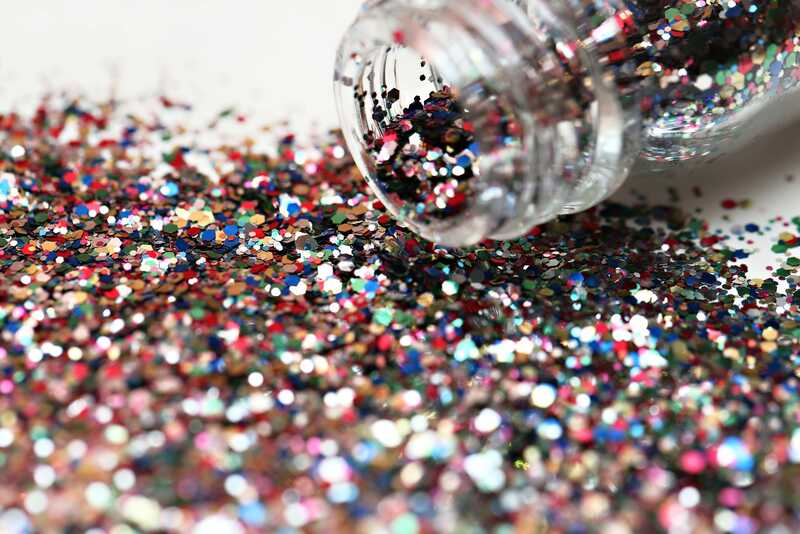 To get this decoration right, you should consider filling empty wine bottles with glitter. The food shouldn’t feel too sophisticated as it can create a mismatch with the country atmosphere. That being said, you shouldn’t limit yourself to family-style meals or a very predictable menu. It’s a good idea to elevate the food a little while maintaining a down-home feel. A neat idea for contributing to the cozy atmosphere with some food is to display some eye-catching desserts. We recommend apple pie pops with cinnamon. Some great pieces that can form the backbone of your barn wedding decorations are the structures made from reclaimed wood. It can create an unexpectedly elegant effect for such a rustic setting and that’s definitely welcomed for an important celebration. 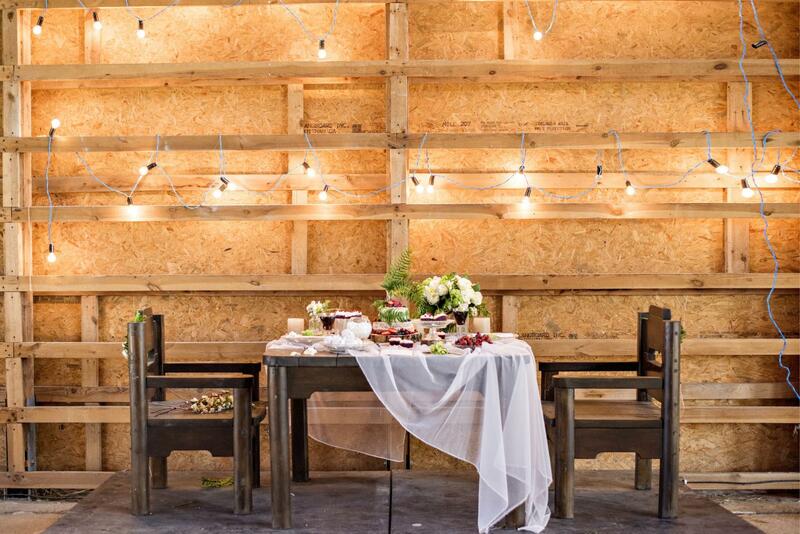 One of our favorite methods to incorporate wood in a barn wedding is using old wooden crates. Continuing with decorations made out of wood, another popular option is to use wood pallets. They’re a treasure trove of versatility as you can put them to good use in an impressive number of ways. Barn weddings can definitely benefit from their potential considering the rustic design. Try placing the pallets for seating, cocktail tables, or even create a DIY ceremony backdrop. When you feel that you’ve added plenty of elegant decorative pieces, perhaps it’s time to offer some counterbalance through more rural elements. 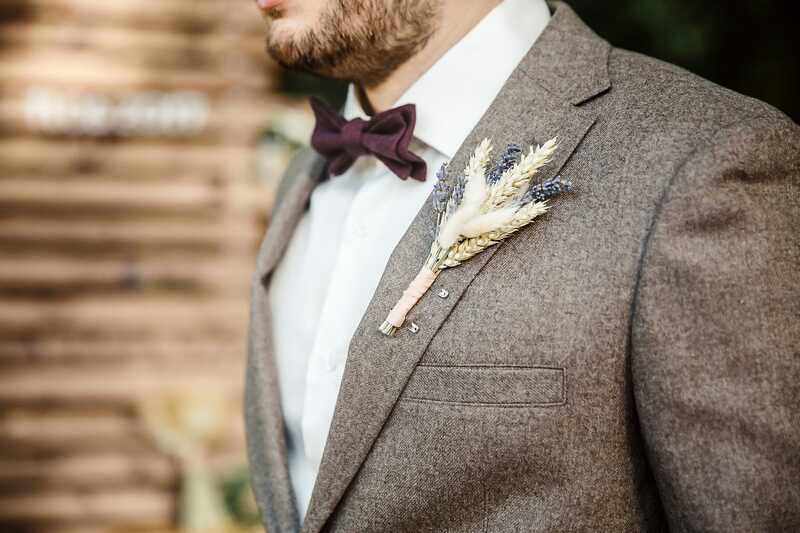 One of our favorites is wheat which can be incorporated as a boutonniere. It reminds you of rolling fields and can fit in nicely with the rustic setting. 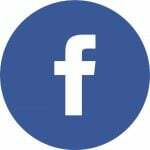 If you’re running out of great ideas for favors, consider some more inventive ideas that can go along well with the country style of the barn wedding. 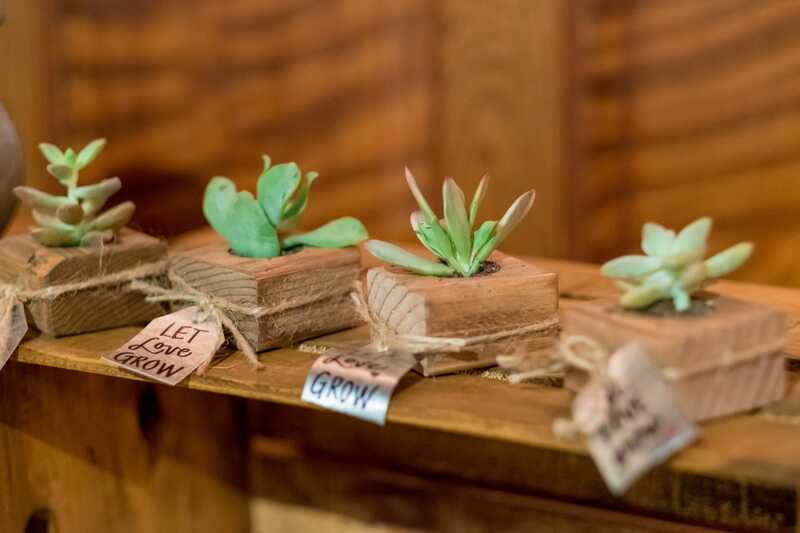 Mini succulent plants can be incorporated nicely as favors together with other little decorations or just by themselves. Another neat suggestion is to use classic chocolate chip cookies. 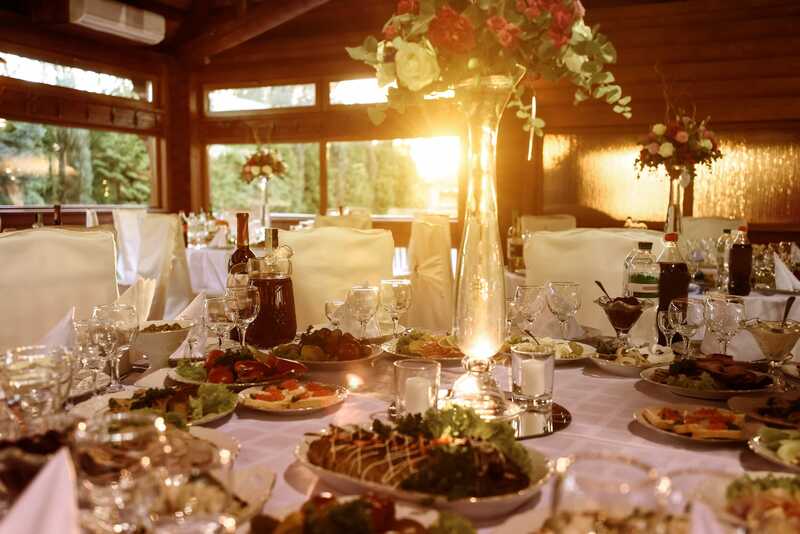 You can be certain that everyone will like the homely taste and this is why they should be part of your barn wedding. 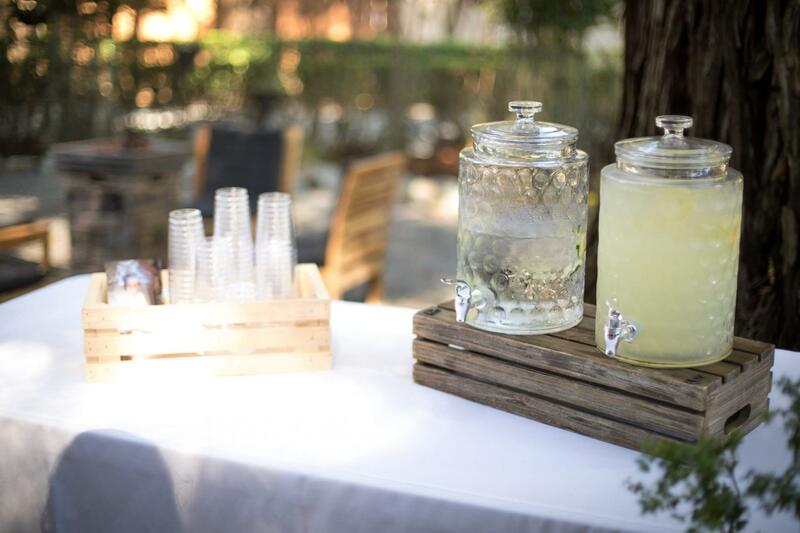 Your barn wedding can make use of some more natural drinks. 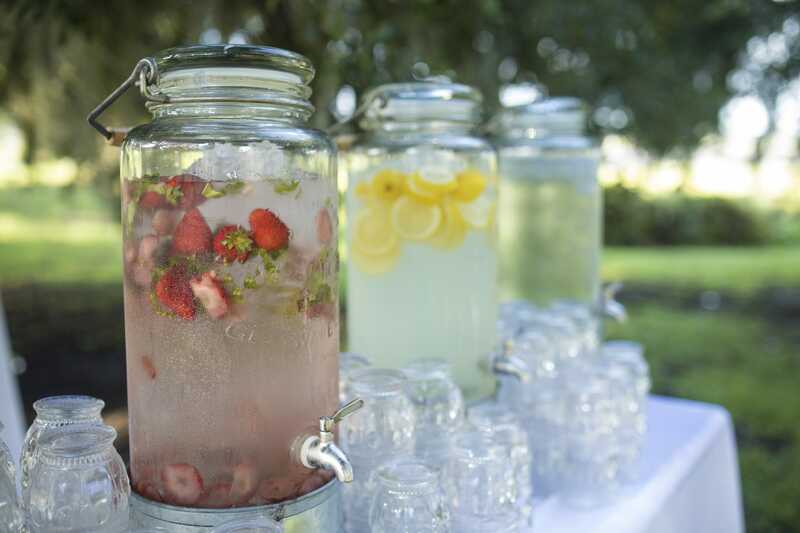 Instead of sugary beverages, how about offering your guests a great assortment of flavored water drinks. You can use a wide range of fresh fruits such as blackberries and grapefruit or limes to create some delicious beverages in a more natural style. This idea is also an excellent match for the kind of carefree celebration that you’d expect at a barn wedding. For those who prefer something a bit more stylish, you should consider the selection of a different kind of barn, aside from one made of wood. 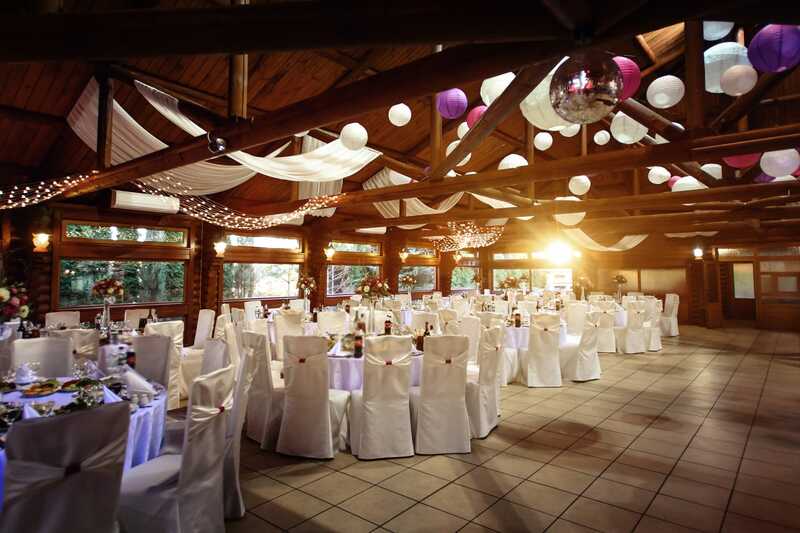 Stone barn venues are rarer to find, but you won’t be disappointed by the extra elegance they provide. Try to go for a place with big windows and a lot of greenery. The sunflower represents a traditional countryside symbol. Incorporating it into your barn wedding through various accents has great decorative potential. 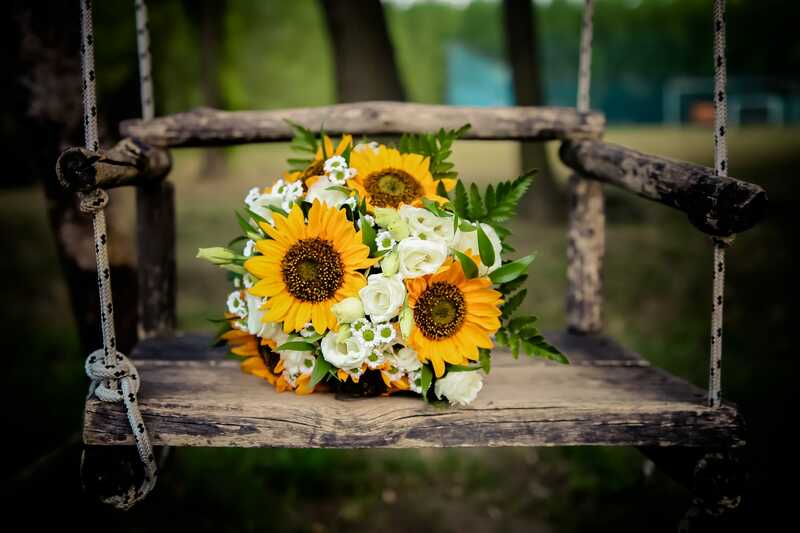 Whether you add some sunflowers to the reception tables or place them down the aisle, their vibrant qualities should complement well any rustic wedding. 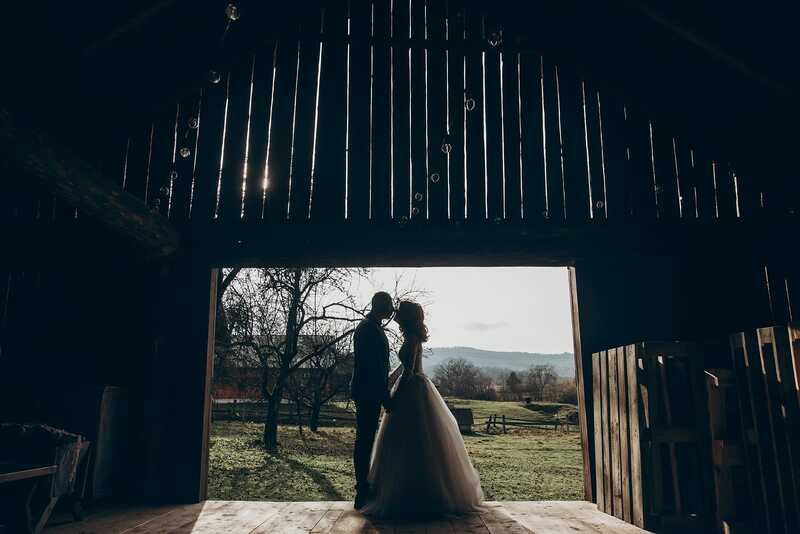 Having a barn wedding is all about standing out from the crowd of couples who choose standard venues. 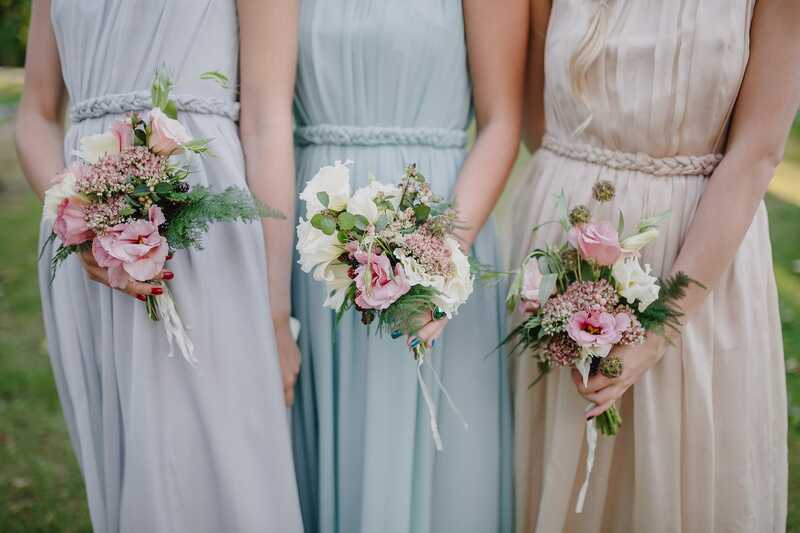 The same principle seems to apply to the idea of mismatched bridesmaids. By choosing more casual outfits that aren’t all the same color, you can create a hand-touched vibe that greatly adds to the rustic celebration atmosphere. It’s time to take a break from the usual formal pieces that lack personality. A solid idea to create a more rustic-styled wedding cake is to go for a semi-naked variety. 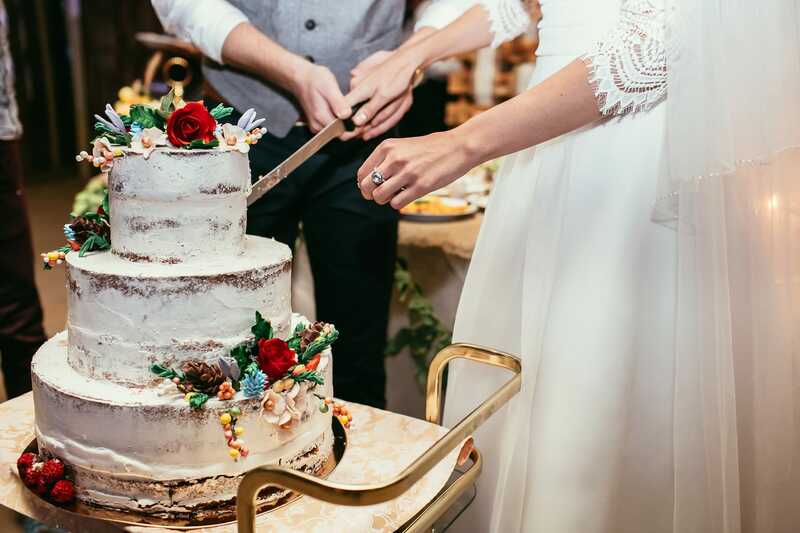 Somewhat similar to the full naked wedding cake trend, the semi-naked style promises a more rustic flavor as it’s just partially covered in buttercream. If you want to have a barn wedding, it’s highly recommended to try a unique wedding cake design like this one. This is a very interesting suggestion that may not be to anyone’s tastes, but it can definitely fit in for a barn wedding. 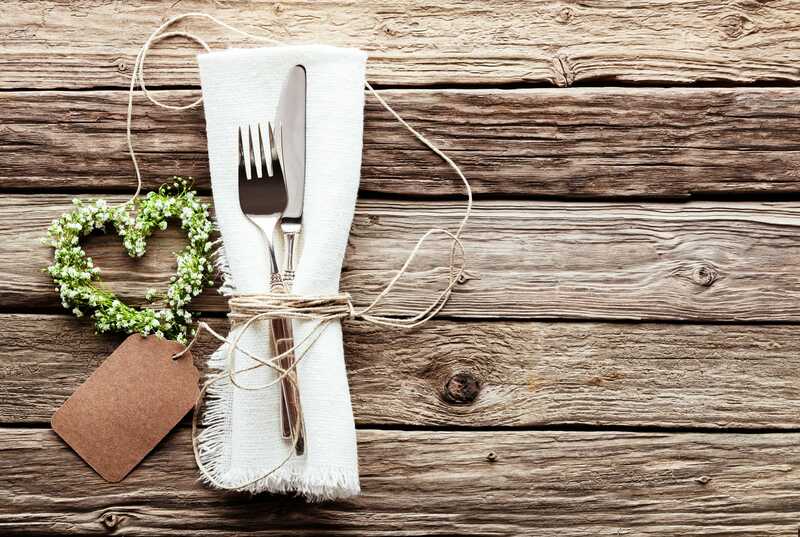 Choosing to have no tablecloths immediately transforms the look of the tables by showcasing the natural beauty of the wood.With the right décor, the ‘no tablecloths’ idea can be a success for a rustic wedding. Traditional vases may not fit in an ideal manner at a barn wedding. If you prefer something with a more rustic edge, perhaps you could consider changing them with jam jars. This is a low-cost alternative to decorate the tables. To showcase the countryside theme even further, try embellishing the jars with hessian and tie with string. A standard wedding veil might look out of place at a barn wedding. If you want to match the rustic theme better, you can finish off your bridal look with a flower crown. This is not a very difficult DIY project, but if you’re overwhelmed by too much work, this is a task that can be handled by your florist. For a bonus effect, make sure it matches the look of the bridal bouquet. 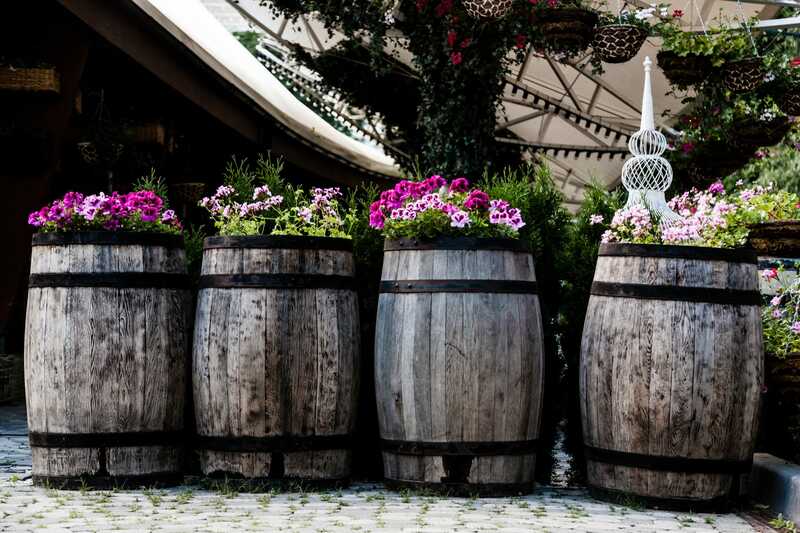 Barrels are very rustic decorative elements that can represent perfect additions to a barn wedding. These versatile pieces can be incorporated in multiple ways. Some good suggestions are to place them with floral arrangements near the rustic bar or to use them as cocktail tables. We like these reclaimed wine barrels made of oak wood found on Amazon. 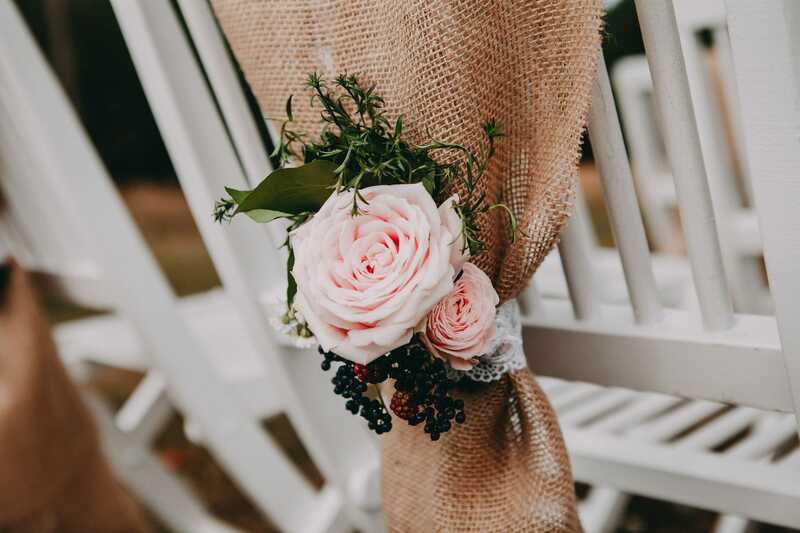 As chairs can seem a little too formal for a rustic wedding ceremony, we recommend swapping them out for wooden benches. One great side effect is that you won’t have to work as hard on decorations for them compared to the chairs. When you take a step back and focus on why you’re doing all these preparations, remember that your lover is the only reason you are putting your heart and soul into it. So when something might not go as planned, keep in mind that the only thing which matters is to be happy together with your loved one. Thanks for reading this far! if you liked our article don’t forget to share it because we put a lot of love and effort in putting it all together.